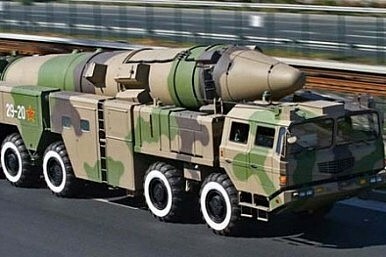 Commentators have made much of China’s DF-21D (dubbed by many as the "carrier-killer") anti-ship ballistic missile (ASBM), which reportedly entered limited service with the People’s Liberation Army’s Second Artillery Corps, or missile force, in late 2010. Their assumption, doubtless correct, is that the U.S. Pacific Fleet represents the ASBM’s primary target. But just as U.S. commanders plan for the hardest case—or against the most capable prospective foe—and trust that the resulting capabilities can handle “lesser included” challenges, PLA commanders can use the ASBM not just for anti-access scenarios involving the U.S. Navy but to pummel less formidable fleets. This is Beijing’s unseen big stick. And a long arm brandishes it. Just look at the map of Asia contained in the Pentagon’s annual reports on Chinese military power. Rivals like Japan, Taiwan, the Philippines, Vietnam, and most of India all fall within the ASBM’s reach according to American estimates. (Scroll down to page 42.) That lets PLA gunners strike throughout the China seas, well into the Western Pacific, throughout the Bay of Bengal, and into the Arabian Sea—all without deploying launchers outside China’s frontiers. And if ships at sea are at risk, they’re even more exposed while sitting stationary alongside a pier or at anchor. If the U.S. Navy appears flummoxed by the ASBM, what can smaller Asian navies do? It depends on the fleet. Relatively generously funded services like the Indian Navy or Japan Maritime Self-Defense Force have the option of building stealth features into their latest surface warships, such as the JMSDF’s contingent of Aegis destroyers or the Indian Navy’s Kolkata-class destroyers. Real questions linger about the PLA’s capacity to find targets at sea. The most lethal ASBM can do little without accurate, real-time fire-control data. The more elusive the ship, the better its chances of surviving an ASBM assault. Asian navies can also avoid the problem altogether by diving underwater. And indeed, Tokyo has announced plans to expand its diesel submarine fleet, among the world’s finest in terms of quality. New Delhi is building diesel subs of its own while inching toward a viable force of nuclear-propelled attack boats. Earlier this year the Indian Navy belatedly took delivery of the Nerpa, a Russian Akula II-class SSN. Now rechristened INS Chakra, the Nerpa will help acquaint Indian mariners with the workings of modern nuclear-powered submarines, opening up new vistas for undersea warfare. Nor are submarine acquisitions confined to major Asian fleets. Vietnam has made headlines with plans to acquire six Russian-built Kilos, but other Southeast Asian states like Indonesia, Singapore, and Malaysia operate subsurface flotillas of their own. Over the long term, however, the ASBM problem may warrant more ambitious countermeasures. Hardening naval bases against preemptive strikes is an obvious measure, if an expensive and thus unpalatable one. Asian capitals can also rethink the makeup of their navies. I have become a convert to the idea that East Asian fleets should disperse firepower among a host of small combatants that are cheap and can be built in large numbers; pack a wallop; can operate in wolfpacks; and can take shelter in caves and other havens that are hard to find or attack. Trying to sell officialdom on fast patrol boats could be tough, though. It would mean deemphasizing light aircraft carriers like the JMSDF’s “helicopter destroyers,” or the Taiwan Navy’s Kidd-class guided-missile destroyers, in favor of unglamorous small craft. Yet that looks like the best strategic option for navies inhabiting an increasingly hardscrabble neighborhood. India is an uncomfortable exception to this advice. With ambitions spanning an entire ocean and perhaps beyond, New Delhi can hardly found a great navy on short-range missile craft. Hardening its bases, operating beneath the waves, and pursuing high-tech active and passive countermeasures represent its main options. The Indian Navy, in short, finds itself in much the same predicament as the U.S. Pacific Fleet. Missile Defense's Real Enemy: Math Reality Check: US Naval Primacy Is Not GuaranteedWhy China May Limit “Carrier-Killer’s” Range Is China’s “Carrier Killer” Already Operational?Did China Test its "Carrier-Killer?"